This year marks the 50th anniversary of the Rolex Middle Sea Race. 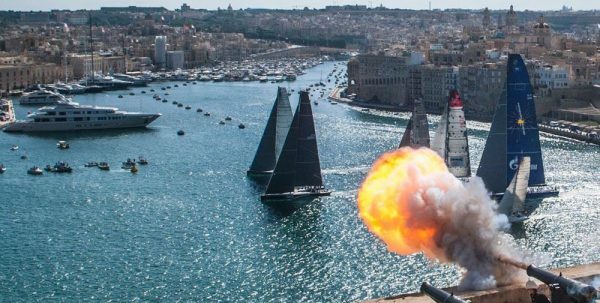 The Royal Malta Yacht Club is anticipating the largest fleet ever, with 74 confirmed entries already. This is a superb race in stunning scenery, and one that shouldn’t be missed. Starting from the Grand Harbour in Valletta, beneath Fort St Angelo and the Saluting Battery, the fleet heads northeast along the coast of Sicily, towards the Straits of Messina. You can usually spot Mount Etna and hear the Volcano rumble. The course heads north from the Straits in the direction of Stromboli, another active volcano, where the yachts then turn west to the Egadi Islands. After reaching Favignana the fleet heads south towards the island of Lampedusa with the Island of Pantelleria on their port side. Once they have passed Lampedusa the fleet is on the home straight towards Malta and the finish at Marsamxett Harbour. The Rolex Middle Sea Race is a challenge for both skippers and crews. Everyone has to be on their A game to cope with the demanding and often changeable conditions on the 606nm course. Performance Yacht Charter have a number of great charter options available for this iconic race, from individual spots to whole boat charters. The Pogo 12.50 was designed by Finot-Conq and built by Pogo Structures in France, it’s modelled on the Open 60 round the world race boat. Packed with speed and stability, the Pogo 12.50 does not sacrifice comfort for performance. Imagine yourself surfing at 10 to 15 knots with ease, pushing yourself and the boat to top performance… chasing 25 knots. Since their introduction, J122s have quickly set the performance standard for dual-purpose 40 foot racer-cruiser sailing yachts both inshore and offshore. Racing against the latest 40′ competition, the J122s continue to win in all conditions around the world. In 2017 Noisy Oyster was 1st in Class in the Rolex Middle Sea Race. The XP 44, with its highly optimised hull shape, combines impressive performance with simplicity of handling for exemplary sailing in a range of wind conditions, on all angles of sail. Named Sailing World’s Yacht of the Year in 2014, XPrime is well suited to offshore racing, is light on the helm and very well mannered in all conditions. We have individual spaces available onboard the TP52 Anafesto, a fully carbon fibre grand prix racing yacht, with a powerful sail plan and deep keel, built for uncompromising performance. She will regularly hit speeds over 25 knots! The individuals price is €3,750pp and this includes all boat and race costs, two training days, four professional crew, long-sleeve Henri Lloyd crew t-shirts, food and refreshments whilst racing.